Super Savings Item! Free Shipping Included! Save 37% on the AKASO A200 FPV Drone with 720P HD Camera WiFi APP Live Video 6-Axis Gyro 2.4GHz Altitude Hold Foldable Arms RC Drones for Kids Beginners Adults by AKASO at Open Drone. MPN: AK-D-A200. Hurry! Limited time offer. Offer valid only while supplies last. Notice! : To use real-time transmission for live video, pair the mobile app to the drone and connect APP first, then connect the Remote Controller. To use real-time transmission for live video, pair the mobile app to the drone and connect APP first, then connect the Remote Controller. Finally, switch to "remote control mode" on app. To avoid losing or damaging the craft, please don't use it in strong winds. You can connect your phone to the drone to experience first person views during flight. The phone APP is also VR compatible, just turn on "3D" mode and place your phone in a VR headset (VR Headset not included). 3D FLIP & ROLLS: A200 folding drone controller comes with the latest technology of 6-Axis Gyro flying control system offer strong stability. When it's stable, you can get it doing more tricks: up/downward, left/rightward, 360 degree rotate, etc. 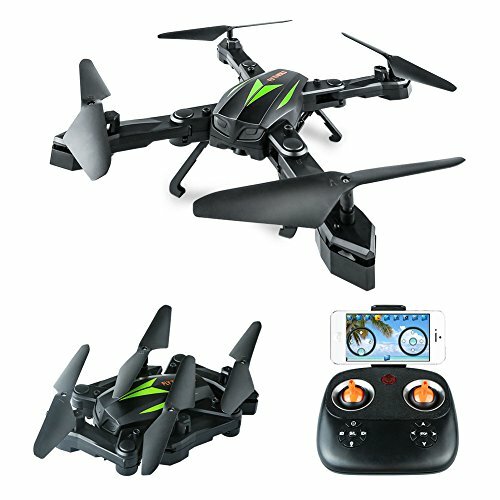 ALTITUDE HOVER FUNCTION: Powerful air pressure altitude hold function allow you to release the throttle stick and the drone will keep hovering at the current height. Easy for you to shoot quality images or videos. 720P HD FPV CAMERA: Equipped with adjustable 720P HD camera to record high quality video or take clear images. Capture your friends and family from aerial view shots and see the world from a new angle. ONE KEY RETURN & HEADLESS MODE: With one key return mode, avoid losing the aircraft with the simple push of a button. Tips: You must be in Headless mode to use this. When you hold the one-key return button, the drone will return and land near the transmitter. FOLDABLE QUADCOPTER DESIGN: Using foldable aerofoil technology to protect the arms;the AKASO A200 drone is easy to take with you anywhere. If you have any questions about this product by AKASO, contact us by completing and submitting the form below. If you are looking for a specif part number, please include it with your message.